Is Your Aging Parent Trying to Tell You Something with Her Personal Hygiene? Your elderly family member’s personal hygiene can give you much more information than you might first think to look for. Start looking for the deeper reasons behind her change in behavior. This allows you to get to the root of the issue so you can help her to solve the problem. She’s Neglecting Personal Hygiene Altogether. Body odor or seeing your elderly family member’s unbrushed hair can be a big signal to you that personal care tasks are being avoided by her. Try bringing the topic up gently with your aging adult and see what she says. If she doesn’t want to talk about it, you might need to bring her doctor into the conversation. She’s Seemingly Confused about What She’s Done. Some aging adults start to become confused about what they’ve done in terms of personal care. For example, your elderly family member might tell you that she’s just had a bath when you know for a fact that it’s been a week since her last one. This is a good opportunity to talk with your elderly family member’s doctor about running some tests. She’s Having Difficulty Managing These Tasks at All. When you can see that it’s difficult for your elderly family member to hold a brush or to handle other personal care tasks, offer to help. If she accepts your help, this might be something that you can do together regularly. Your elderly family member might avoid this, however, so be prepared. Another problem could be that your aging adult starts avoiding you completely. 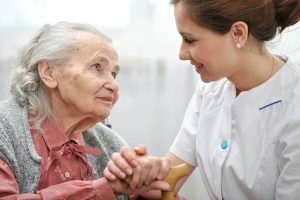 This might mean that she knows that there’s a problem with her ability to continue managing her care tasks, but she doesn’t want to deal with it. She might be embarrassed or she might have deeper issues that are causing her to hold onto this behavior. Either way, it’s important to get to the very bottom of this situation. If you’re able to help your elderly family member with her personal care tasks, that’s great. But some aging adults actually prefer the help of an elder care provider. Talk to your senior and learn her preferences. If you or an aging loved one are considering elder care in Hazlet, NJ, please contact the caring staff at Lares Home Care 888-492-3538 or 732-566-1112.